Cochlodina orthostoma. Picture: © Sigrid Hof (Source). Snails are very unhurried creatures, a fact nobody will doubt. They stop for a phase of dormancy especially when the environmental conditions are not favourable. There are mainly two environmental factors that influence dormancy in snails: Dryness and cold. 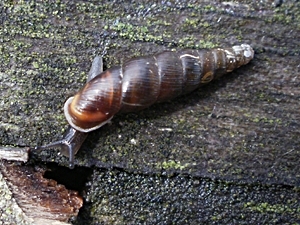 Most snail species mainly move in the night and during the early evening and morning, when it is still cool and humid. Usually that is also the only time when snails can be found without a search. During the heat of the day and the dry hours of noon, snails remain in a dormant state called aestivation or dryness sleep. Their behaviour during this dormancy is quite different between species. What they have in common is to close their shell mouth with a membrane of dried mucus, after settling at their place of dormancy. An exception are the door snails (Clausiliidae). They do not need a membrane. Like their name already states, their shell has a closing apparatus with a small shell plate, the clausilium, closing the aperture like a door. Thanks to their slender, spindle-shaped shell, door snails can also withdraw into the protection of crevices on trees and walls where they usually look for food. Other snails do not have this possibility. They trust the protection of their shell. Snails that remain outside during their aestivation can usually be recognized by a rather brightly coloured shell, reflecting the sunlight and so minimizing evaporation. That is why in open habitats, banded snails (e.g. 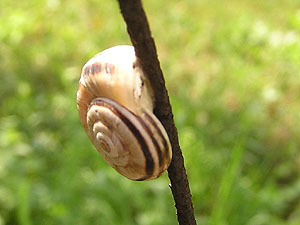 the garden banded snail, Cepaea hortensis) usually have yellow shells. Other snail species have adapted even better to sunlight and dryness: Heat-loving (xerophilous) snail species of dry habitats, such as heath snails (e.g. 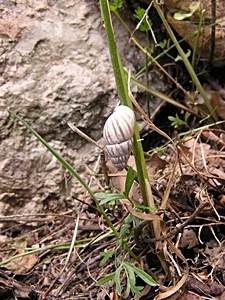 the Eastern heath snail, Xerolenta obvia) or the zebra snail (Zebrina detrita) possess a whitish shell, which for the sake of camouflage also shows dark bands. And so on warm days whole bushes can be seen hanging full of small whitish heath snails aestivating there. Other snails hide in the ground when they are aestivating. Slugs cannot protect themselves with a shell, which is why they withdraw to a protected place. So they are often found in the garden, hidden under shelves lying around. Many slugs also dig into they ground when it is too dry. Other than their smaller banded snail relatives, Roman snails also like to dig into the ground during dry weather, or they hide under the herbal vegetation. The Corsican snail (Tyrrhenaria ceratina) may even dig as deep as 60 cm! The Sicilian snail (Cornu mazzullii) can acidify its mucus and then etch holes into the limestone rock it lives on. So it can withdraw during heat and dryness and also be protected against predators. Aestivation of the Roman snail. The other extreme is the winter cold, which most snails cannot endure easily. Many slugs, e.g. the large round back slug species (Arionidae), die in autumn after laying their eggs. But many other snail species can hibernate and grow to several years of age. 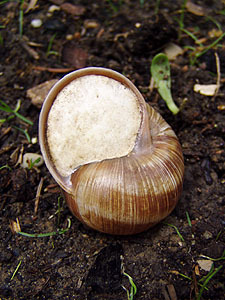 Roman snails' (Helix pomatia) hibernation behaviour is especially highly developed: They close their shell aperture with a lid and inside the shell they withdraw, the resulting air cushions isolating them further against the cold. To stay there during winter, Roman snails dig a hole in the ground, which is additionally bolstered with moss. If the snail excretes superfluous water and dissolves large molecules in its blood, it can endure temperatures of down to -40°C without freezing. During hibernation, a snails activity is reduced to the most vital necessity, even a snail's heartbeat is reduced to a minimum. Hibernation of the Roman snail. The limestone lid, Roman snails produce for hibernation, probably is only a second hand hibernation tool. Primarily it was intended for aestivation during especially dry weather. But it also very efficiently protects the snail from ice. Roman snails also produce such a lid to aestivate, provided they have enough limestone at their disposal. 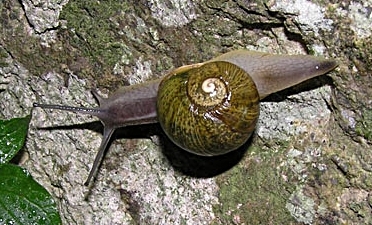 The Mediterranean relatives of the Roman snail, among them the brown garden snail (Cornu aspersum) and the grunting snail (Cantareus apertus) even produce such a lid exclusively for aestivation. Hibernation, like the Roman snail does it, is not necessary where they come from. Beneficiaries of most snail species' hibernation are glass snails (Vitrinidae). Those small snails are predators, and they feed on other snails in hibernation. The frosty temperatures appear not to bother the little predators - they crawl even over snow when they look for food. 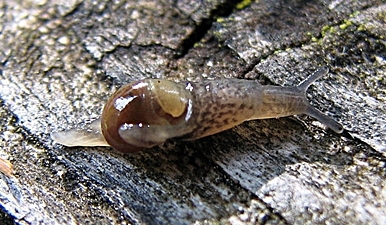 Mountain glass snail (Semilimax kotulae). Picture: Gianbattista Nardi. Naturally it is rather hard to see in such an unhurried creature like a snail, whether it is sleeping of awake, if it appears not to be active. Latest research has resulted in that snails also have phases of dormancy when they are neither threatened by dryness nor by cold. The snails studied were water snails (Pond snails, Lymnaea stagnalis). The scientists first studied the snails' life to find behaviour resembling sleep. And really they found out that there from time to time there were phases about 20 minutes log, when the snails were relaxed and showed a reduced reaction to stimuli, touch as well as food offerings. Most interestingly, the snails did not withdraw into their shells to do so. Terrestrial snails probably also sleep, only they, to protect themselves from dryness and predators, sleep withdrawn into their shell.